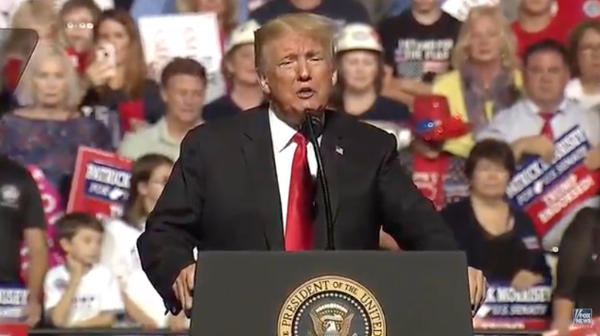 News TRUMP: "A Vote For Morrisey Is A Vote For Me"
WHEELING, WV — Tonight, President Donald J. Trump rallied West Virginians for Attorney General Patrick Morrisey, and slammed Sen. Joe Manchin. TRUMP ON MANCHIN: Now, Joe Manchin voted no on tax cuts for American families, he just voted no. What are you going to say? He voted no on removing Obama’s job-killing regulations… Joe also voted no on repealing and replacing Obamacare, which we almost had done, but I’ll be nice now, we couldn’t get a single Democrat vote. If we did, we would’ve killed it, and we would’ve had great healthcare but we’re giving you a lot of great healthcare anyway. If you look at the plans we’re coming out with are great, and we got rid of the individual mandate—the worst part of Obamacare. And Joe voted yes on something that not too many people in this room like—mass amnesty. Mass amnesty. Joe refused to stand up to the Democrat resistance, the radical open border Dems, Pelosi and their new de-facto leader, the legendary Maxine Waters.